Love the chance to win!! Thanks! Soooo cute….love it! Thanks for the chance to win…Merry Christmas!! Since I found this website can not live without it. Thank you so much. That giftcard is super cute! Adorable gift card and so unique! I would love to win. I would love to win this! I’m on a very tight budget! 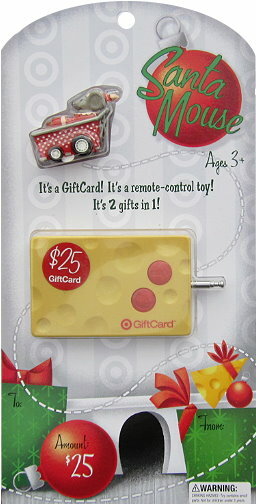 That’s so clever: radio-controlled gift card! Already Like TotallyTarget on Facebook. I hope I win! Thanks! Yay! Ty for the chance. Great website! You’ve saved me a ton of cash. I would LOVE to win this. Thanks for all that you do!! The computer just told me my comment was too short. haha. Love Target and hope to win! I just liked you on FB. I thought I already did! thanks for the contest so I could figure out I didn’t yet.